The 2020 contest has ushered in an unprecedented number of Democratic candidates. In one of the most diverse fields competing for the nomination, standing out on mainstream issues, such as, taxes, the economy or health care is shaping up to be an arduous task. This unfolding central theme this cycle was given new life during Sen. Bernie Sanders’ unexpectedly competitive challenge to Hillary Clinton in the 2016 primary. President Donald Trump’s positions on immigration, climate, health care and the economy often enrage the progressive base on a daily basis — and some Democrats seeking to claim the “progressive” mantle do not have to shy away from the label in the same way that candidates like Clinton and others have in the past. “[Sanders] actually helped move the party and the party has changed since then, and the context of Trump gives Democrats a little more freedom to go into new places,” Julian Zelizer, a professor of history and public affairs at Princeton University, told ABC News. While the former Delaware senator holds onto his moderate label, saying Friday the vast majority of the party is “still basically liberal to moderate Democrats in the traditional sense,” progressive groups reject Biden’s thinking in favor of candidates who embrace this newfound freedom to pitch policy ideas once rejected by a wide swath of the party. 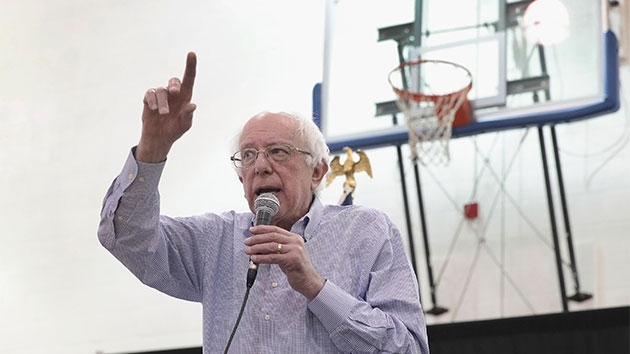 For his part, Sanders’ 2020 policy platform is nearly identical to his 2016 agenda, emphasizing universal healthcare and tuition-free public universities as the cornerstones of his campaign. Earlier this month, Sanders’ campaign became the first in history to unionize and has recently committed to offset the greenhouse gas emissions generated by his cross-country travel by supporting renewable-energy and carbon-reduction projects. “In some ways the unconventional, unpredictable and — some would say — radical aspects of the Trump presidency, have made some Democrats more willing to say why do we have to play it safe all the time? Why not be bold?” Zelizer said. “I cannot only inspire the base on progressive issues that I’m running on like actually passing a ‘Green New Deal,’ ‘Medicare for all’ — health care is a right, not a privilege — but also being able to reach out to those red and purple voters to be heard and to have them come to the table and be represented,” Sen. Kirsten Gillibrand, D-N.Y., said in an interview with CBS News. “I view myself as a progressive, but these labels are becoming less and less useful,” said South Bend, Indiana Mayor Pete Buttigieg, a more moderate voice in the field, on Fox News Sunday. Over three months into the election season, the conversation about what being a “progressive” means is shifting away from the traditional set of policy prescriptions and towards a debate over a series of structural reforms that once occupied the periphery and challenge Constitutional norms. Seeking to find a broad and appealing message to court voters, the party is debating, and some are even embracing, a slate of issues like changing campaign finance rules, reforming the Senate filibuster, eliminating the Electoral College, expanding the Supreme Court bench, and paying reparations for African Americans. At the recent “We the People” summit, top Democratic presidential candidates made their pitches for bold, structural change to an eager audience of progressive activists gathered in Washington. “Everything starts with big, systemic change. How do we reduce the influence of money and power in Washington? We start with an anti-corruption bill, there’s part one,” Warren, one of the most ardent progressive allies, told the audience. While several of the 2020 hopefuls, including Gillibrand, Warren, Buttigieg, California Sen. Kamala Harris and former Texas Rep. Beto O’Rourke, have signaled a willingness to consider packing the court with more justices, on reparations, a far more nuanced debate around how to right the wrongs of hundreds of years of slavery — appears to be splitting the party, which will, in part, rely on a coalition of African American voters to win back the White House. “The debate in the Democratic primary will not be conservative democrats versus progressive democrats. It will be fine status-quo democrats versus bold transformational potential presidents,” Green said.